Click on the link below for a BIG and LIVE color photograph. 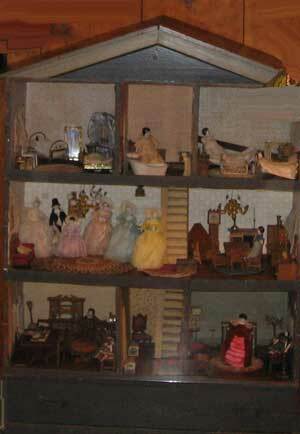 This dollhouse doll has an endearing, quizzical expression due to a raised right eyebrow. A china head on shoulderplate with bisque lower legs and arms, cloth body. Her hand-painted black hair has a center part. She has more blush apparent on her right cheek and a rosebud mouth. Long white pantaloons have lace at their hemline. Black ankle boots are painted on, with a small unpainted area under the left heel.